This is the finished build of one of the legs. To create a cost effective, open source, exoskeleton for parapalegics. It uses an Arduino and an inertial measurement unit to tell linear actualtors when to move joints that simulate the hip and knee. 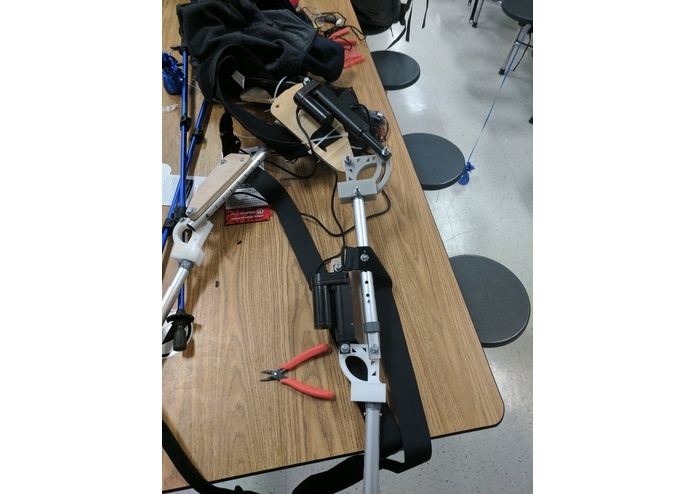 I used 3d printing and recycled aluminum rods from old crutches to create a leg that held onto the actuators and Arduino. The motor shields keep malfunctioning, only allowing one leg to work at a time. I have been able to make a device that should be able to help many people. It will also be significantly cheaper than any other device similar to it. I have learned a lot about using the Arduino IDE with respect to the inertial measurement unit. The project will hopefully be able to work quicker in the future as well as more consistently. I also plan on making the files and code for the project public so that anyone can make this project.